I have TWO sets of cool news to report today. Effective on Monday, Annabelle likes her glasses. Prior to Monday, she would cry and scream and crawl fast the other way at the sight of them. But I believe God knew that I needed some divine intervention before I accidentally threw her glasses in the trash… Because Monday morning, I put them on her, and she was like, “Hm, okay.” We even patched for two hours and she played like nothing was going on. Divine intervention folks, that is all I can say. I took a little video to SHOW you cool thing #2. My problem is, it’s hard to “catch” her in the act, so I had to video her for 6 minutes before I caught her doing it! Yet, she is super cute playing with a billion toys in the 6 minutes that led up to it. But if you want to skip ahead, it’s right around minute 5:50. Please excuse my annoying baby-talk… and Super-Y playing in the background! Yes, indeed, my baby can now PULL TO STAND! AHHHH!!!! This Momma is ultra proud. I walked into her room to get her up from nap on Saturday, and the booger was standing in her crib! After that, I found her that evening pulling up to the TV. And since then, she pulls up on pretty much any piece of furniture that she can!!! I can not TELL you what a huge deal this is to us!!! At the beginning of December, she couldn’t bear ANY weight on her legs and couldn’t crawl. Now she is going EVERYWHERE and she’s just made such GREAT progress! Got a call today. A few weeks ago, we did an over-night pulse-ox study on Annabelle. I’d mentioned that she drops her sats at night some, she dips and then comes right back up, and they wanted to be sure exactly how much she was doing this. Well, it came back that 15% of the night, she was below 90%. The acceptable range is below 5%. So… they are making us put her back on oxygen at night:-( We’ll have to be on oxygen at least until we can get a sleep study done, which won’t be until end of April. AT that time, they’ll evaluate how she does with and without oxygen and have a better idea of what exactly, and how much, oxygen she needs. And if she’s grown and doesn’t need any by then, we’ll find that out too. On one hand, I feel like a big honkin’ baby for being so upset about this. It’s just night oxygen. We can handle that. But it just feels like this giant step backward. More cords, and my poor baby does NOT NOT NOT like oxygen on at night. And it’s just something else to add to our already crazy life. My mother reminded me that I need to trust God, even in this. Trust him that he will give me strength even though I really really just want to collapse and throw a 2-year-old-like temper tantrum about the whole thing. Yet, I believe God can handle our frustrations. And I’m so glad he forgives our whiny moments, because I’ve had my share of them lately. BRIGHT SIDE: I have 2 sets of cool news, and only 1 set of not-so-cool news. That equals PLUS ONE baby! And that, my friends, means progress! 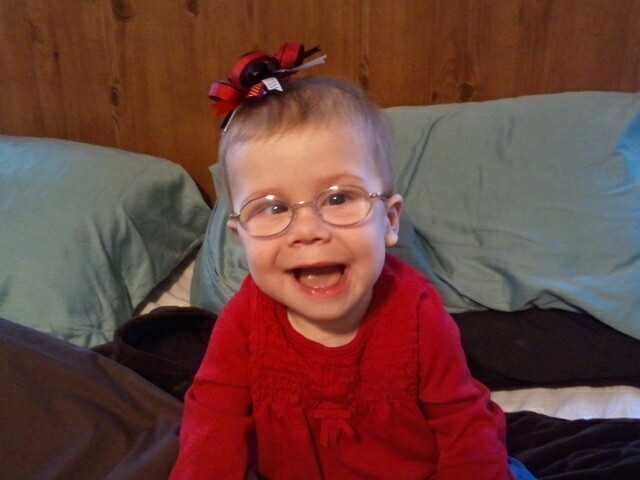 What wonderful news that Annabelle has adjusted to her glasses and that she's pulling herself to a standing position. Yay! Thanks! We're pretty excited about it! *grin* It is my pleasure to show her off! HA! Woohoooo! She's growing so big. I can't believe how much time has passed and how far God has brought you all. What a good thing you caught the night issue. She's a cutie! I know! Sometimes I have to punch myself! And I'm thankful for that too… as frustrating as it is, I know that it could have been much worse had we not realized she was having the issue. Personally, I think you need to go ahead and have that temper tantrum. I know I would. It's frustrating, and you don't always have to be strong about it to be in his will. He understands us, even his daughters' frustrations. You're his kid, too. *sigh* I had my temper tantrum last week over the glasses. It was a doosy. SO I was trying to be a big girl about this. Thank you though, because you're right. God's big enough to handle our breakdowns, and sometimes they are needed! My link in my previous comment didn't work so I'm trying again. 3) Krista, I love you. It's night oxygen. You're pushing really hard for your daughter, and I love you for it. Read this, and tell me if one year ago today you thought you'd be writing this post. Ahhhh, I LOVE going back and "seeing" what was going on a year ago. It is such a great reminder. I'd forgotten we were around that day. It was the day I decided pretty much not to spend the "night" out of Nashville until she got her heart. I KNOW it is just night oxygen. But it's just a step back, a pretty big one at that, and it makes me sad for her. To be honest, a year ago I thought I'd be in this happy-happy home land, as oxygen was not supposed to be needed post-transplant. I was in the "we just need a heart, and everything will be better" mode. I'm now in the reality that we still have issues, and those issues will be ongoing for a long time. So, I'm attempting to accept that reality, and I'll be honest. It's a struggle. But I know it's a struggle that will be worth overcoming, and God will help me. I love you, my friend! You're an awesome momma! Yay to both! Way to go, sweet Annabelle! Precious! So awesome Krista! Fun to watch her standing! Will say an extra prayer for you and her about the oxygen. Yup, it's called the Annabelle dance. I can never close down my computer at night until I've checked for Annabelle news. Couldn't believe that big smile right through the glasses–a miracle compared to last week, and I see she's even allowing a bow :-D. Real sorry about the oxygen but am glad to know how to pray. Hang in there–I know you will. You've made it this far! I just have to say, Annabelle is the freaking CUTEST little peanut. I had glasses as a baby as well, i think they are very stylish! And YAY, YAYYYY for standing up like a PRO!! That's more than enough reason to grin wide this am! I loved watching that video! She is so precious. And I really pray that the sleep study gets done soon, and she doesn't need oxygen at night. Krista, I am amazed at all you and your family have gone through. It is truely inspiring. I am Holly Hussey. I was a cousin by marriage. My stepfather was Rolfe Phillips. I still consider all the Phillip's family. Linda has told me all about you guys. I just read all about Her story and cried through all it. As a christian myself, your story is a blessing and show God preforms miracles daily. I would love to meet you if you ever come to Siler City to visit. God bless you and your family.